AgroAtlas - Pests - Aphis pomi Degeer - Green Apple Aphid. Aphis pomi Degeer - Green Apple Aphid. Class Insecta, order Homoptera, suborder Aphidinea, superfamily Aphidoidea, family Aphididae, subfamily Aphidinae, tribe Aphidini, subtribe Rhopalosiphina, genus Aphis. Oligophagous pest of fruit trees of the family Rosaceae. Body of apterous female is yellow-green, with brown head, ovoid, having lateral marginal tubercles. Body length reaches 2 mm. Antenna is yellow, six-segmented, shorter than body. Antennal tubercles are low; frons prominent between antennae. Siphunculi are cylindrical, long, black, narrowing near covers (2 times as long as fingerlike black tail). Body length of winged female varies from 1.8 to 2 mm. Head, thorax, antenna, legs, and siphunculi are black; abdomen is green with black spots on segments VI-VIII. Oval eggs are black. Sexual agamous generations are present during the aphid vital cycle. The species uses one host plant. Overwintering takes place during the egg phase near bud bases on young twigs of fruit trees (apple, pear, plum, cotoneaster, hawthorn, mountain ash and others). Hatching of fundatrices larvae is observed at the end of April and in the beginning of May in the northwestern region of Russia; in the middle of April in Moldova and Ukraine; and at the end of March and the beginning of April in Middle Asia. Larvae populate opening leaf buds at first, then young leaves (lower and upper side) and flower buds. Leaves become yellow, twist, and dry. Larval period of fundatrices lasts 16-25 days. Its fecundity varies from 23 to 38 larvae. Winged females appear in the third generation, migrating to other plants of the same species as the main host. The aphids prefer to feed on young plants. Here they reproduce during the entire summer period; in old gardens, they propagate at the beginning of the season only. Maximum aphid numbers are observed at the end of April and May in southern regions; at the end of May and June in northern ones. Life span of apterous parthenogenetic female is 25-40 days; its fecundity reaches to 100 larvae. Larval period lasts 8-12 days. Virginoparae appear at the end of summer. It takes place at the beginning of September in northwestern regions of Russia; at the beginning of October in Ukraine and Moldova; and in middle and last thirds of October in Middle Asia. Copulation and reproduction take place; eggs are laid in October until strong frosts (-10°C) and until falling of leaves; they are laid in groups (3-5 eggs) on bark near bud bases. The insect is widespread in Europe, Asia, North Africa, and North and South America. Within the territory of the Former Soviet Union, the species occurs widely: in the European part of Russia, in Siberia (the south of taiga and forest-steppe zone), Primorskii Territory, Middle Asia, Kazakhstan, and Transcaucasia. Embryonic development begins at the temperature -5°C. Hatching of fundatrices larvae is observed at the temperature 6.4-7°C (sum of degree days is 33°). Fundatrices appear until apple trees begin to bloom, when the degree days reach 105°. Degree days 120° is necessary for development of one generation. The pest produces 8 to 17 generations during a year. Most important predators include Coccinella septempunctata L., C.undecimpunctata L., Adonia variegate Goeze, Adalia bipunctata L., Chilocorus bipustulatus L., Calva punctata Muls., Syrphus corollae F., S. vitripennis Mg., S. balteatus Deg., Scaeva albomaculata Macq., S. pyrastri L., Sphaerophora scripta L., Chrysopa ventralis Kill., Ch. carnea Steph., Aphidoletes aphidimyza Rond., Leucopis glyphinivora Tanas, Ephedrus plagiator Nees., Aphelinus mali Hald., and Praon volucre Hal. These aphids cause the greatest harm in steppe and forest-steppe zones of Ukraine and Russia, in Middle Asia, Kazakhstan, and Transcaucasia. The pest causes the greatest damage on apple, pear, plum, and quince. It also feeds on mountain ash, cotoneaster, hawthorn, bird-cherry peach, apricot, and almond trees. Control measures include timely forecasting pest appearance and number and insecticide treatments at the end of April, in May, and in June. Abyshov T.B. 1975. Biological features of green apple aphid and its control. In: Mamedova S.R., ed. Proceedings of Session of Transcaucasian Board to coordination research works on plant protection, vol. 7. Kirovobad. P. 163 (in Russian). Akhmedova M.Kh. 1983. The dynamics of green apple numbers and its regulation factors. Izvestiya Akademii Nauk Tadzhikskoi SSR 2: 71-75 (in Russian). Arakelyan A.O.& Saakyan Z.A. 1969. The study of green apple aphid biology and test of preparations against pest in North-Eastern Armenian. In: Ul'yanishchev V.I., ed. Proceedings of Session of Transcaucasian Board to coordination research works on plant protection, vol. 4. Baku: Elm. P. 174-7 (in Russian). Fratkin A.B. 1968. Aphid and Black-Viened White. Zashchita rastenii 3: 41 (in Russian). Kazanok G.T., Rafal'skii A.R. 1972. The green apple aphid in the south of Ukraine. Sadovodstvo, vinogradorstvo i vinodelie v Moldavii 2: 37- 38 (in Russian). Koltun N.E. & Meleshko N.E. 1992. Effectiveness of entomophages that feed on green apple aphid (Aphis pomi Degeer) in Belarus apple nurseries. In: Samersov V.F., ed. Proceedings of Byelorussian research institute of plant protection, 17. Minsk: Byelorussian research institute of plant protection. P. 136-41 (in Russian). Koltun N.E. 1990. Economical threshold of green apple aphid in nurseries. Dostizheniya nauki i tekhniki 4: 19-20 (in Russian). Koltun N.E. 1995. Economical thresholds of green apple aphid (Aphis pomi De Geer) in apple- trees nurseries in Belarus'. In: Samersov V.F., ed. Proceedings of Byelorussian research institute of plant protection, XVIII. Minsk: Byelorussian research institute of plant protection. P. 3-9 (in Russian). Koltun N.E. & Meleshko N.E. 1994. Predators of green apple aphid (Aphis pomi De Geer) in apple-trees nurseries in Belarus'. In: Antanyuk V.S., ed. Vestsi Akademii agrarnykh nauk in Belarus, N 4. Minsk. P. 57-9 (in Byelorussian). Migulin A.A., ed. 1983. Agricultural entomology. Moscow: Kolos. P. 256- 258 (in Russian). Popova A.A. 1956. The influence of feed factor on aphid development and reproduction. Ph.D. Thesis. Leningrad: LSKHI. 14p. (in Russian). Rakauskas R.P. & Rupais A.A. 1983. The biology of green apple aphid in Lithuania. Acta entomologica Lituanica 6: 20-29 (in Russian). Rakauskas R.P. 1981. To biology and ecology of green apple aphid in Lithuania. In: Onaitis A.P., ed. Plant protection in Baltic republics and in Byelorussia. Part 3. Vilnius. P. 36 (in Russian). Samersov V.F., Koltun N.E., Trepashko L.I. & Kartashevich V.N. 1996. Harmfulness forecasting for green apple aphid. Zashchita rastenii 6: 36 (in Russian). Sapalev G.B. 1969. 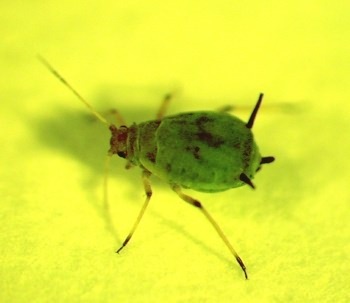 To biological features of green apple aphid (Aphis pomi Deg.) in Grodno region conditions. In: Sapalev G.B., ed. Proceedings of Grodno agricultural institute, N 5. Gorki: Grodno agricultural institute. P. 146-9 (in Russian). Shchegolev V.N. 1960. Agricultural entomology. Moscow & Leningrad: Sel'khozgiz. P. 307 (in Russian). Stolyarova F.A. & Bei-Bienko G.Ya. 1967. Biological features of green apple aphid in Leningrad region conditions and its parasites of the family Hymenoptera. In: Fraer S.V., ed. Proceedings of Leningrad agricultural institute. Leningrad-Pushkin: LSKhI. P. 105-13 (in Russian). Stolyarova F.A. 1971. Fecundity of green apple aphid in relation to host plant condition. In: Chumakov A.E. & Tanskii V.I., ed. Proceedings of VI research conference for young scientists. Leningrad:VIZR. P. 4-5 (in Russian). Stolyarova F.A. 1972. The influence of soil humidity on fecundity of green apple aphid. In: Roshchevskii M.P. & Puchkov V.N. 1972. Proceedings of V Komi republic research conference for young scientists. Syktyvkar. P. 249 (in Russian). Vakhidov T. 1971. To fauna of entomophagous insects that feed on green apple aphid in Fergana valley. Uzbekskii biologicheskii zhurnal 2: 46-8 (in Russian). Vodolagin V. 1926. The green apple aphid. In: Shembel' S.Yu. Proceedings of Astrakhan' plant protection station. 4 p. (in Russian).